To turn on the files extensions in Windows 7, you need to open the Power Options Properties dialog box from the Control Panel. 1 – Click on the Start Menu. 2 – Click on Control Panel. 3 – Click on Appearance and Personalisation. 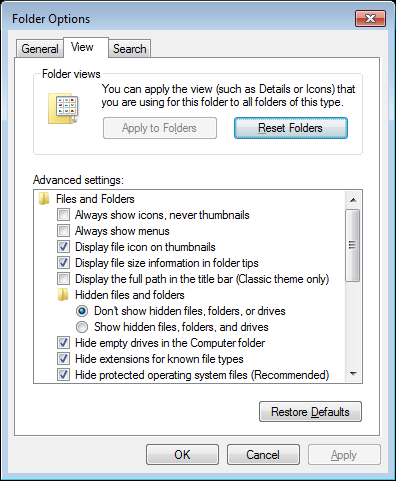 4 – Click on Folder Options. 5 – Click on the View tab. This section allows you to change your default view for Windows Explorer to the view of your currently opened Windows Explorer. For this tutorial you can ignore this section. This section allows you to change the way Windows Explorer looks and feels. Under the Advanced Settings section on the View tab in the Folder Options dialog box, disable the tick box called Hide extensions for known file types. Then click on the Apply button to save the changes. Now, whenever you open Windows Explorer, you will see the file extions type at the end of the filename.